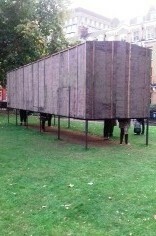 If you walk through Bloomsbury Square between now and November 10th you will notice what appears to be a long low shed floating some three or four feet off the ground. You will probably also be able to see the legs of a number of people standing inside this structure which, on closer inspection, will be found to consist of a metal frame with the intriguingly tactile and fragrant covering of tar-paper. What you are looking at is the Pushkin House Pavilion http://www.pushkinhouse.org/pavilion2017/, designed by Alexander Brodsky to house an art installation entitled 101st km, Further, Everywhere which is concerned with Russian poetry in exile and is one of many events to mark the centenary of the Russian revolution. The 101st km refers to the fact that dissident poets (and others) were often sentenced to a kind of internal exile and forbidden to come within 100 km of any major city; while further, Everywhere are the actual words of the railway station announcement about trains leaving Moscow, to summarise all the calling points beyond the city. In the context of this exhibition the words convey the vastness of Russia (and the world outside) into which an exile has to go. The Pavilion has no door. To enter it you must stoop to about waist height and duck beneath the tar-paper wall. Once inside you will find an empty space on whose walls are twenty sheets of A4 paper, each containing a poem – in Russian with an English translation – by a noted Russian poet. More will be said about the poems in a moment; but the experience inside the pavilion is (intended to be) augmented by film projections at either end as if from a train. This feature, unfortunately, was not working when your reviewer made his visit; but evidently the projected view at one end is of a springtime scene being left behind while at the other end we seem to be moving towards a winter landscape. If the thought had not struck you already then these railway scenes will remind you that the pavilion does not only resemble a shed but also looks disturbingly like one of those closed goods trucks which in the last century have conveyed so many victims to appalling destinations. The installation has been curated by Markus Lähteenmäki and the poets featured include some – such as Osip Mandelshtam and Daniil Kharms – who suffered under the worst of Stalin’s purges, and others like Marina Tsvetaeva and Vladislav Khodasevich, who left Russia in the early 1920s when artistic restrictions first began to be imposed. Others in the exhibition stayed and survived the purges even though they continued to make their protests against the system. Among this group are Boris Pasternak and Anna Akhmatova. The exhibition also makes room for some from later generations of poets (Joseph Brodsky, Natalya Gorbanevskaya) who were silenced by the regime and had to emigrate in the 1970s. A single poem by Pushkin reminds us that it is not only in the last one hundred years that poets have needed to take the risk of speaking truth to power. or an instrument of higher forces. I simply knew what to do. I did it. But they’ve taken the list where your names were preserved. That poignant couplet struck me particularly forcefully on a day when it was being reported with some alarm in Britain that a government MP seemed to have been seeking to compile a list of university lecturers who had been delivering courses on Brexit. This particular matter may well turn out to be a storm in a tea cup; but Akhmatova and the other poets being commemorated here would, I’m sure, want to remind us of the terrible uses that can be made of lists of people who seem to fall into a particular category. And the act of compiling such a list should always prompt the question who is doing this and why? For me, perhaps the most surprising poem in the exhibition was one from Semyon Lipkin which, with its echoes of the Psalms, or maybe a passage from the Book of Job, seemed oddly out of place as the product of a very secular time in history. How can you be broken down? It is to my shame that I failed to note the names of translators of the above extracts. But London Grip readers will be able to rectify my omission and give credit where it is due if they heed my strong urging to make time to visit this exhibition in the two weeks it still has to run.